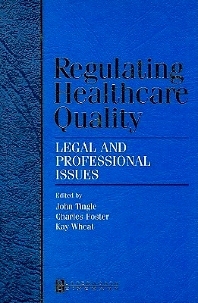 The key focus of this edited U.K. text is on the legal and professional conflicts and issues that can arise from regulating health care quality. Doctors and nurses all increasingly face a number of dilemmas with regulating health quality issues such as increasing levels of complaints and litigation, scarcity of resources, under-staffing, professional discipline, clinical governance, clinical risk management, etc. This U.K. book spells out and discusses these issues, taking an academic approach, though this will be tempered with a practical focus on issues.